If you have a mutt and you live in the Chicagoland area, then you just have to go the Great American Mutt Show. 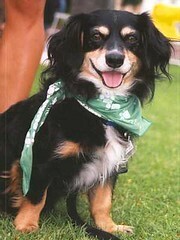 The Great American Mutt Show will feature a variety of competitions for mixed breeds and rescue dogs. The event will also be promoting no-kill animal shelters in the Chicagoland area. Here are some of the various contests that your mutt can enter in: Best Kisser, Most Macho, Most Misbehaved, Most Unusual Bark, Best Waddler and many more. The Great American Mutt Show is on Saturday, May 19 from 9am-5pm at Morton West High School. Here’s your chance to shine! This entry was posted on Friday, May 11th, 2007 at 3:49 am	and is filed under Dogs, Chicago, Events for Pets & Owners, Animal Shelters & Charity. You can follow any responses to this entry through the RSS 2.0 feed. Both comments and pings are currently closed.